One cold and dreary morning last week, our hopes of playing outside squashed, I was on the hunt for a fun indoor activity. I found this link for How to Create a Sandcastle That Lasts from Family Fun. I was cold, and grumpy about being cold so the thought of sandcastles, the beach and warm summer days made this just the activity I was looking for. Not to mention that the girls love playing with any kind of dough and I already had all the ingredients! So I nabbed a cup of sand from our backyard sand box and mixed it in a small saucepan with 1/2 cup of cornstarch and 1 teaspoon of Alum. Two things I should note here, If you don't have Alum, you can buy it in the spice aisle at most grocery stores. I think it is really used for pickling or something but it is often called for in play dough recipes so I had a jar on hand. The second thing is that since we make a lot of non-edible stuff in the kitchen, I have a cheap saucepan just for mixing play dough and other stuff. While you don't necessarily have to have one for this project, the sand does scrape up the pot a little so you probably don't want to use a good pan. After adding all the ingredients to the pan we mixed in 3/4 cup of water and stirred the mixture over medium-high heat for a few minutes. One thing I have learned about any kind of corn-starch clay is that it goes from not done to done really quickly. So for the first few minutes the mixture was really liquidy, but after a few minutes of stirring it all came together to a dough consistency, at which point you want to take it off the heat. After letting it cool for a few minutes I kneaded it a few times before giving it to the girls. As I was expecting they loved the sand dough. They spent a long time sticking straws in, cutting it up with plastic knives and forks and just squishing it with their fingers. 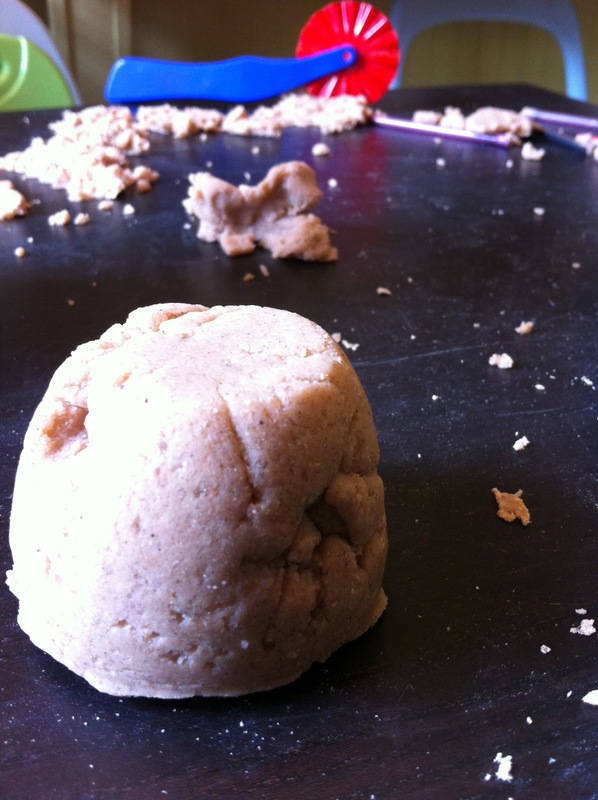 The dough really does look like wet sand and holds a shape well. We enjoyed putting the dough into plastic bowl and then turning it over just like when you make sandcastles at the beach. After the girls were done playing I put the dough in a Ziploc bag and we played with it again the following day. After a few days in the bag it got very dry and crumbly so I threw it out. Family Fun does however say that you can make something and let it dry a few days to harden. We didn't try it but it might be fun experiment for another day. Oh, this looks so fun! Thanks for sharing! Thanks Miranda! Definitely fun and easy, I bet you little ones would love it! my son loves sand. Thanks for sharing! Thanks Jaime! It really does feel just like wet sand so I bet he will love it! We've had so much rain around here lately. Thank you for this wonderful post with the Weekly Kid's Co-op. I'm Pauline and I blog over at http://lessonslearntjournal.com. May I please feature this (with a picture from your post) as part of my roundup of this week's linky party? I would also love to pin a picture from your post onto our very popular Weekly Kids' Co-op interest board :). Hope to hear from you soon. Hi Pauline! Thanks so much for checking, I would love to be included and I can't wait to see what other great ideas are part of your round-up!